Are you looking for high quality tipper grabs to hire or purchase in Manchester and the surrounding areas? If so, you’ll be happy to know you’ve come to the right place! 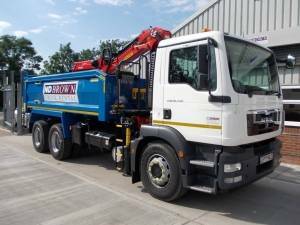 Here at N.D Brown we pride ourselves on being the number one choice for providing tipper grabs in Manchester, and are confident that we have the perfect tipper grab for any and all projects, big or small. With a whole host of options, you’re sure to find exactly what you need with N.D Brown! 7.5 tonnes – This is the perfect size for smaller jobs, or projects in areas where space may be limited. 26 tonnes – Offering a payload of about 12 tonnes, this mid-sized tipper grab is perfectly suited to medium sized projects in Manchester. 32 tonnes – This is the largest and most powerful tipper grab that we have available in Manchester. With a payload capacity of 16 tonnes, this tipper grab is perfect for large scale projects, whether personal or commercial. Whether your project is big or small, whether you’re moving earth, clay, concrete, or general commercial waste, we have the perfect tipper grab for you! You can get yourself acquainted with our Manchester tipper grab fleet here. To discuss your needs with one of our friendly and knowledgeable team you can give us a call. Perhaps you know exactly what you’re looking for in a tipper grab in the Manchester area? If so, simply fill out our booking request form here.